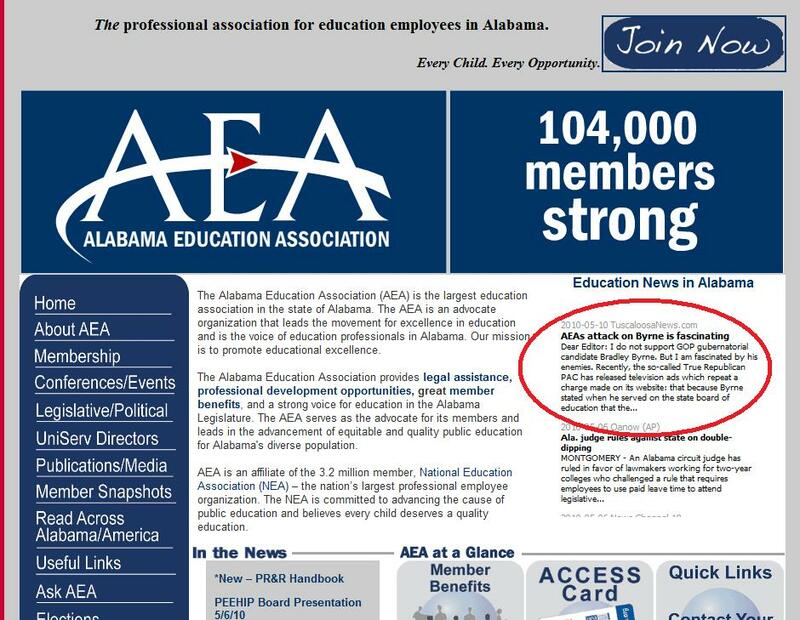 It looks like the responsible party is the True Republican PAC which is financially backed by -- get this -- a teachers' union and affiliate of the National Education Association, the Alabama Education Association (AEA). Yup, that's right, it appears a bunch of Alabama public school teachers (unknowingly, I presume) helped pay for an ad lambasting the Governor because "he supported the teaching of evolution" (gasp!) and because he may not believe in a literal interpretation of the bible. The group behind the ad and others attacking Byrne's conservative credentials is called the True Republican PAC. Interestingly, as the Montgomery Advertiser reported last month, the PAC has gotten most of its money from the teachers' union -- or, more accurately, from a collection of other PACs heavily funded by the union. If the AEA really did give $500,000 to attack Byrne, one has to stop and wonder if they're spending their members' dollars wisely. Judging by these actions alone, it appears the AEA is failing that mission. That is of course unless (1) they mean to exclude the religiously diverse part of that "diverse population" they claim to be advocating for, and/or (2) somehow creation pseudoscience qualifies as their idea of "educational excellence". 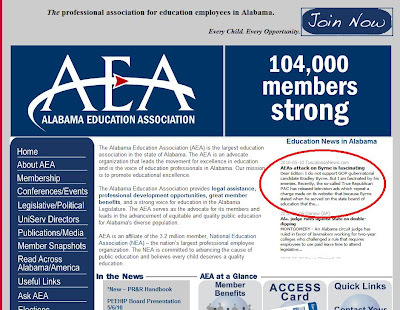 ...in the form of a letter to the Tuscaloosa News, calling out the AEA for financing the anti-evolution ad. After Byrne's disappointing response to the attack ad, I wouldn't be surprised if moderate republicans look elsewhere when they cast their vote for Governor. As an educator here in Al this is why I belong to NSTA but not AEA. I certainly need to do a good bit of careful research on all the candidates this year. Glad to hear that the NSTA is an adequate alternative. Does the AEA have a reputation for this kind of thing? So much for excellence in teaching (hard to do if you are not using the natinally recognized current view of evolution in your science classes. Then there is this, "AEA will communicate a positive image of public education and the Association". Oops...this current controversy will certainly not help the image of education in AL. You do have to keep in mind that many teachers view their profession as a religious calling. Still, I think there would be more than a few members of AEA that would be both surprised and disappointed that their dues helped fund this ad.